Ureteroscopy is performed under anaesthesia. Most cases will require a general anaesthetic or spinal anaesthetic. Simpler cases can be performed comfortably with sedation alone. A kidney stone blocking a ureter can often be removed by trapping it in a wire “basket” and carefully pulling it out. Various instruments including laser, ultrasound, or mechanical energy are used to fragment larger stones and allow their passage or removal. . 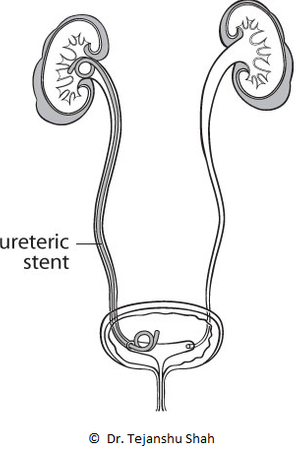 Upon completion of the procedure, a thin plastic tube (ureteric stent) may be placed temporarily in the ureter to prevent blockage while any swelling resolves. This tube must be removed, usually within a few days or weeks. Many patients can be discharged from hospital on the day of their ureteroscopy.